Seven weeks into your pregnancy, or five weeks after conception, your baby’s brain and face are rapidly developing. Tiny nostrils become visible and the lenses of the eyes begin to form. The arm buds which sprouted last week now take on the shape of paddles. You baby is now cushioned by a thin membranous sac and will be immersed in amniotic fluid during your pregnancy. The baby will be protected from all but the most severe jolts while floating buoyantly in temperature controlled surroundings. Little edges now appear signaling that tiny fingers and toes are beginning to emerge on the buds that are developing into baby’s extremities. Facial features are marked by hollowed areas on the face. Internal organs are in place although not completely developed nor operating on their own just yet. Your baby has nearly grown twofold as blood is circulating brilliantly through your baby from the liver. 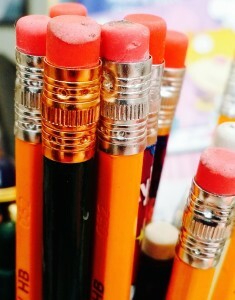 By the end of this week, your baby might be a little bigger than the top of a pencil’s pink eraser. The EPV method is a screening tool performed by your health care team and is simply done while you are having your baby’s ultrasounds around 10 and 18 weeks. Normative curves for EPV between 10 and 40 weeks are available from Dr. Kliman. 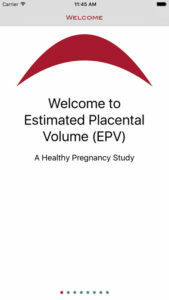 A significantly small placenta determined by EPV may be associated with IUGR of the fetus and should alert your doctor to follow your pregnancy more closely. The complications from a small placenta do not occur suddenly and the results can be devastating. 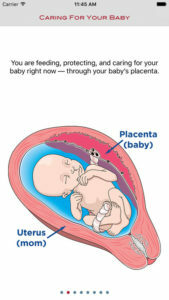 The most severe outcome of a very small placenta is an intrauterine fetal demise. Using the EPV may help warn doctors of this complication before it’s too late. Your health care team can learn more about EPV by visiting the Yale School of Medicine. You are invited to join Dr. Kliman’s pregnancy study to monitor your expected baby’s placenta, the organ that develops in your uterus during pregnancy to provide your baby nutrients and oxygen. You may download the EPV ResearchKit app, designed by Dr. Kliman and available from the iTunes Store to your iPhone or iPad. 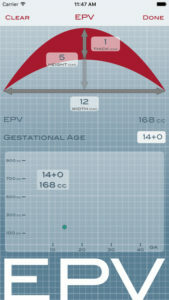 This EPV app allows you and your health care team to track the link between the placental volume, the amount of nourishment supplied to your baby, and a healthy pregnancy. By participating in this study you will help researchers to understand normal and abnormal placental growth. Once you are found to be eligible to join, you will sign a consent form; the EPV will be recorded at each ultrasound. At the completion of your pregnancy, your health care team will be asked to report your pregnancy outcome (the researchers have no access to your personal information). Speak with your health care team about becoming part of this exciting new study to ensure the wellbeing of your baby while proactively helping to secure your baby’s health on delivery day.